Considered the ultimate resource for all things swimming, USA Swimming is a 400,000-member service organization that includes swimmers, parents, coaches, officials and volunteers. We designed a site that filtered content based on user profiles and made it easier to find relevant news, events, time rankings and more. Inspired by everything from pool tile to swim meet flags, we designed original icons for use across the site. With a wide ranging audience, we assigned a unique color to each of USA Swimming's five core users. Iconography and other elements of the site change appropriately, according a user's profile. 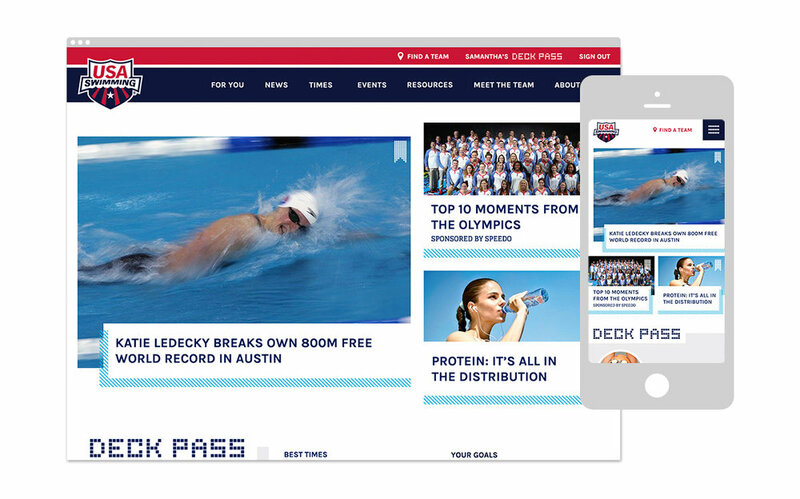 In addition to a complete redesign of the organization's website, we also redesigned, Deckpass, USA Swimming's web app that allows swimmers, parents and coaches to connect with each other, track a swimmer's or team's times and progress and earn achievements.